A free scavenger hunt launches this Saturday and runs all the way until December 12th. All you need to do is follow the hashtag #12DaysofArt. Each morning at 8am, the San Jose Downtown Association will post a clue on Facebook and their website. The clue will have a photo and written hint and all you have to do is figure out the location of the venue. If you are one of the first 10 people to arrive at that location at the specified time, you win a prize! This is an amazing incentive to explore Downtown San Jose. I hope this event gets bigger and bigger every year! All of the details are below. What: #12 Days of ARTS – a social-media driven scavenger hunt for arts prizes. More than 120 chances to win, including two Grand Prizes! Free to compete and win. Why: An opportunity to give back to our community and encourage folks to have fun exploring San Jose and its vibrant arts scene. Theater, music, dance, museums, galleries, more. Follow the hashtag #12DaysofArts and your favorite San Jose arts organization’s social media sites. 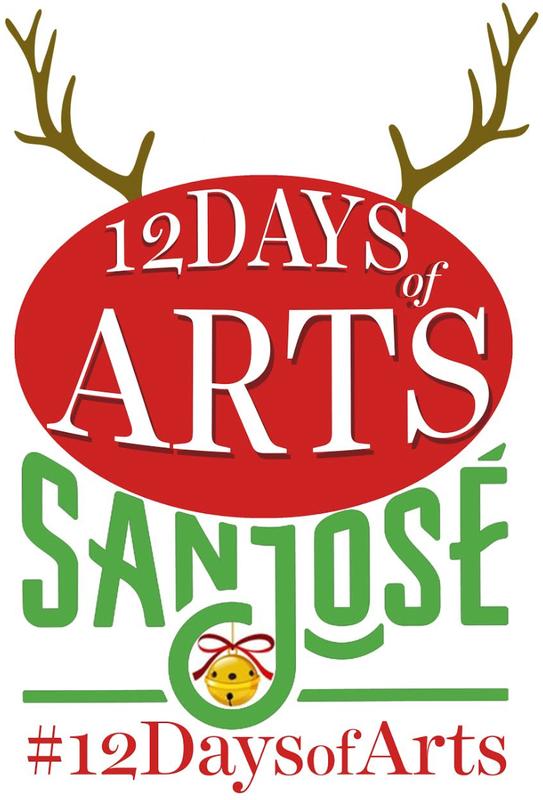 Each morning at 8 am, the San Jose Downtown Association will post a clue on their website at sjdowntown.com/12DaysofArts and on their Facebook page @sjdowntown. Watch for the #12DaysofArts clue consisting of a photo and a written hint. You must figure out the location of the day’s venue. The specific time to arrive will be noted. It could come at any time during the day. How Does #12 Days of ARTS Work? Each morning a clue will be posted on the San Jose Downtown Association’s Facebook page @sjdowntown, which will also stream at sjdowntown.com/12DaysofArts and be shared on numerous arts and related downtown social media sites. To play the game, you must figure out the “secret” location of the arts organization…a theater, a gallery, museum, events venue, etc. and be one of the first 10 people to arrive at that location at the specified time to win a prize package. Those 10 people (or teams) are guaranteed to win a bag filled with wonderful arts surprises like free tickets to shows, entries to exhibits and fun events to participate in. Other surprises await such as dining coupons, free beverages, and logo items of hats, T-shirts, coffee mugs, and more. Ten bags are given away every day…sometimes more! Every person is limited to TWO wins of the prize bags over the twelve days of the scavenger hunt, but even if you are a two-time winner, you should keep participating! Every person who finds the correct location is entered into the drawing for a grand prize. The more you participate, the more entries you get. The first 10 winners each day are asked to take a selfie showing the location of the arts organization from the clue and posting it to their social media with the hashtag: #12DaysofArts. Two GRAND Prizes will also be awarded through random drawings. If you missed a chance to win an Arts Prize Bag on any given day, you can still enter for the Grand Prizes by snapping a selfie and posting it to your social media with the hashtag. Anyone can play one time, or all twelve days! Additional Information: This is the fourth year of #12 Days of Arts. It grew out of the monthly “brown bag lunch meetings” of the Arts Marketing Roundtable and it has been such a huge hit over the last three years, that we've brought it back again. Winners have included people who played the game just once or played every day, people who had never been to a live theater event or a symphony concert or a museum before, and even people who had never even been DOWNTOWN before. We had so many people miss out on prize bags last year, that we have added the element of GRAND prizes and have made them open to anyone…whether you won a prize bag or not. To enter to win, just post a selfie in front of one or more of the “secret” locations and include the hashtag #12DaysofArts. Random drawings will determine the winners.